Fafnir – Nordic Journal of Science Fiction and Fantasy Research, Volume 2, Issue 4, pages 66-67. Koistinen Aino-Kaisa. 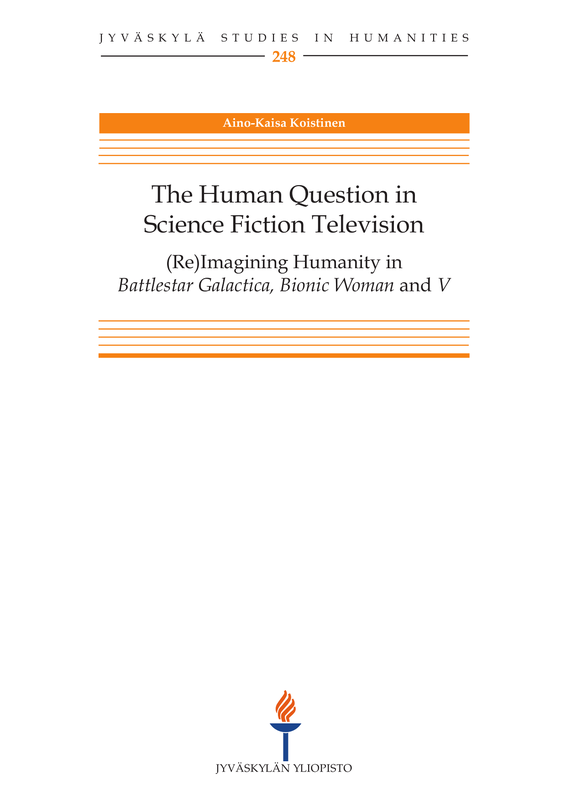 The Human Question in Science Fiction Television: (Re)Imagining Humanity in Battlestar Galactica, Bionic Woman and V. Jyväskylä: University of Jyväskylä, 2015. ISBN 978-951-39-6147-3. Science fiction has long been in the business of exploring and reimagining the boundaries of humanity. An abundance of aliens, robots and other non-humans have been pitted against and juxtaposed with humans for various purposes. Often they are simply the necessary monster for the human heroes defeat, but other times the non-human is there to reveal something about humanity. This is also true for the three television series that Aino-Kaisa Koistinen focuses on in her doctoral dissertation The Human Question in Science Fiction Television: (Re)Imagining Humanity in Battlestar Galactica, Bionic Woman and V. These television series negotiate the boundaries of humanity in conflicts between humans and non-humans as well as in the blending of human and non-human. Koistinen focuses on what she calls the human question, by which she means “the changing understandings and meanings of being human” (11). Koistinen approaches this question by looking closely at how humans and non-humans are represented and where the boundaries between the two lie. She explores the way these boundaries are constructed, how they shift and change and how the representations contribute to cultural-historical, political and ethical understandings of humanity. Since she focuses on both the original and re-imagined versions of the series, she is also able to trace developments in the representations across time. Koistinen’s theoretical framework is threefold. Firstly, she connects performativity to include not just gender but humanity. In order for the non-humans to pass for human, they need to behave in a recognisable and intelligible manner in addition to having the right kind of appearance. Secondly, she uses the concept of grievable, ungrieavable and livable lives to analyse how the series question the separation into ‘us’ and ‘them’, into those who will be grieved and those who will not. As viewers are invited to sympathise and to identify with both sides, the distinction between grievable and ungrievable begins to break down. This also destabilizes the frames of war if the opposing sides cannot be separated, which in turn affects whether the war is perceived as justified. Thirdly, Koistinen complements both these approaches with posthumanism. The fact that non-humans stretch the boundaries of human, also means that they are redefining the future of humanity. This is especially evident in the blending of human and machine into a cyborg, which challenges what it is to be human. The dissertation is divided in five parts followed by three of the four original articles. After laying out the foundation for her study in the first section, Koistinen goes on to talk about science fiction television in section 2. She situates the three series in historical perspective and shows how the human question has been explored in science fiction television. In section 3 she outlines her theoretical and methodological framework and offers summaries of the four original articles in section 4. In the final section Koistinen draws her conclusions as well as outlines some of the limitations of her study. In the first article, the only one written in Finnish, Koistinen examines the representation, reproduction and performance of gender in Battlestar Galactica. She questions straightforward interpretations and begins to connect gender performance with performing human. The second article focuses on passing for human in Battlestar Galactica and V. It explores how humanity is constructed, what kind of power structures involved in the process and how humanness can slide between humans and non-humans. The third article (not included) explores the cyborg body in Bionic Woman and the way that gender is inextricably linked to being human. The fourth and last article concentrates on the frames of war in V, how these frames define grievable and livable lives and how the series both construct and break these frames. Through careful analysis of the series Koistinen demonstrates how gender and humanity are constructed through performance and how the problems in these representations reveal the norms and conditions of humanity and the contradictions within. She maintains that the series demonstrate and expose the shifting and sliding status of humanity. The very concept of humanity becomes unstable as non-humans succeed in measuring up to humanist ideals while humans fail and as the two cannot always be distinguished from one another. The fact that Koistinen includes both the original and reimagined versions in her analysis, unlike most studies on the series, allows her to analyse how the boundaries of humanity have changed over time and what humanity is defined against in different historical contexts. She is also conscious of the real world implications of her work. When the binaries between human and non-human are questioned, this calls for a re-evaluation of which lives should be counted as grievable and livable. Through her choice of method Koistinen also avoids simply evaluating the series’ success or failure in representing gender or humanity, instead examining how these are constructed and then analysing the problematic nature of the stereotypes. Though there is some overlap in the articles, Koistinen provides interesting insights into the Battlesar Galactica, Bionic Woman, and V and into the human question. As Koistinen notes herself, understanding the division between ‘us’ and ‘them’ and how the separation is upheld and undermined is very topical in the recent surge of xenophobia and immigration, and this can be only more so today.